First of all, this is not my usual photo blog entry. This is my respond to the email which I received from Mr Sergio Redegalli regarding my previous post, "Graffiti, Racism, Newtown". I just couldn't find a better place to post this, so if you are not interested in, skip this please. So a bit of background story. About 4 weeks ago, I watched a documentary, 'Dumb, Drunk and Racist' from ABC 2 in Australia. In the first episode of the show, the four Indian people met the artist who paint a picture with the message saying "SAY NO TO BURQAS". If you haven't seen the documentary, you can find them on YouTube. The confrontation scene starts from 5:10 in Part 2 of the video. Anyway, on that weekend after I saw this on TV, I coincidentally had a photo shooting in Newtown, Sydney and the group of photographers actually had a chance to visit the site ourselves. Apparently, I was very curious about the wall and the painting after watching the show. So, I took some photos, gathered my thoughts then I posted my blog entry, "Graffiti, Racism, Newtown". About 4 weeks after my initial blog posting, I received an email from Sergio Redegalli himself, which I want to introduce. Thanks for your typical left wing blar blar blar, it is always interesting seeing people like yourself support an Ideology that is totally against everything you stand for as a free person. “You tolerate & support a group of people (not a race) that are completely intolerant of you and I”. You need to read a great deal more about the ideology you so blindly support, from your comments, It is very clear that you have not read the Koran, Hadith and sharia tex. You take very good images Scott, try some critical thinking as well, stop being a typical apologist. Islam is an entirely separate civilization, it is a dualistic system of law. The Burqa Mural was painted because a gay fashion designer / friend was told that his shop would be burnt to the ground if he used Burqa as part of his Fringe festival fashion / fetish design. His action was to self-censor himself out of fear !!! So you think censorship is positive -------it seems.? At this point Scott, you are one of the smallish / number of ill-informed people crying out the safe and predictable racist, bigot, lines. Hopefully after you read a bit more you may start seeing the error in your finger pointing. I am always happy to talk to people like yourself, and spend time helping you put together a reading list. Nevertheless I give lectures all over Australia about freedom of Expression, my next talk will be In Perth next month, I will be adding your name and link to the list of miss informed people, showing others what people like yourself express without any knowledge and critical facts. First, I would like to apologise to you, Mr. Sergio for my poor choice of wording in the original blog post. The way I criticised you was in fact very childish, and inappropriately told. Only excuses I have would be that English is not my first language, also my blog is not the most popular blog on the Internet, and when I write here it still seems like writing on my own diary, which sometimes lead me to say stupid things. I am sorry. However, except for those words I chose, I have no intention to apologise for my opinion on Freedom of Speech nor the criticism I had on what you painted and told on the documentary. As a matter of fact, I would like to discuss about the email you sent to me. What really made me surprised was your lack of understanding of the nature of my criticism and the political stance you thought I was standing. 1. I was not supporting the people who threatened your gay fashion designer friend. I think this is the biggest misunderstanding you have on me. I'm not supporting those extreme behaviours nor tolerating them. In fact I didn't mention anything about them and I was only talking about you and your belief of exercising of Freedom of Speech, which I don't think it's right. 2. I do not think censorship is positive. This is how your email goes. I criticised you => Therefore, I support a group of people who threatened your friend => Hence, you think I am likely to support censorship? Don't you think this is a bit of 'Black or White' in conjunction with 'Faulty Generalization' fallacies? Before you try to teach me critical thinking, why don't you teach yourself some logical thinking? 3. You motivation is good, but the way you sent your message out is wrong. The motivation behind your painting is noble. Those people who blackmailed your friend must be ignorant extremists and the act of threatening should never be allowed in any places. However, this does not mean that I support your painting either. For instance, let's assume that if my gay friend tried to use the cross symbol from the Christian church in his design and a group of extreme Christians blackmailed him saying, "We will burn down your house if you use the cross in your fashion show". I would paint "Allow Cross In Gay Fashion Show" instead of "Say No To Cross". Do you see my point? I don't believe every people who actually wear burqa threatened your friend, so why are you finger pointing people who wear burqa and the whole culture behind it? You even said that you don't believe in minority rules in a society, the statement gives good enough impression that you want to ban a particular cultural practice as a whole. 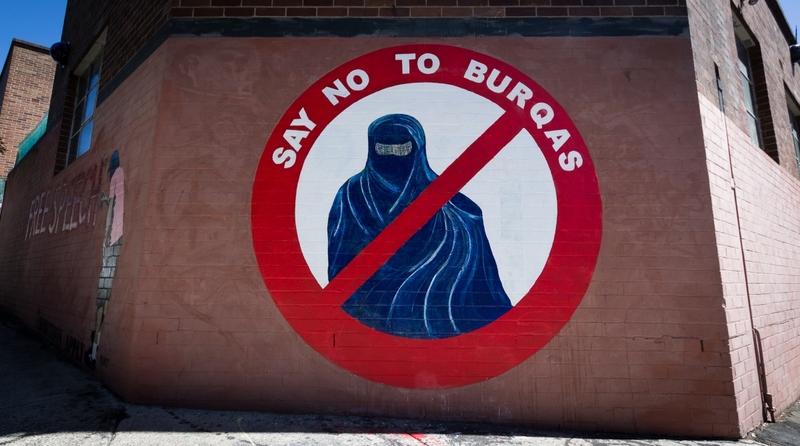 At that point I realised that the real target of The Burqa Mural is the people wearing them, not the people who blackmailed your friend. I do not believe in the existence of any kind of god. Therefore, to me the some religions seem absolutely pointless as their most fundamental principal looks deeply flawed. But who cares what I believe? In the end everyone can believe whatever religion they want, and it's because we live in a free country, right? That's also why we have a secular government and constitution. The act of extreme behaviour can be handled with the civil law. Hence, there is no need to blame a particular culture or ignite conflicts with them, which those extremists originally came from. And that is what you are completely denying of doing it under the name of Freedom of Speech and calling it 'controlled fire'. Hence, that is why I would like to return 'a typical apologist' back to you. p.s: If you are going to list my name in your lectures, please do and don't forget to include this post, too.